Advice for Knowledge Workers Threatened by Robots | What's The Big Data? 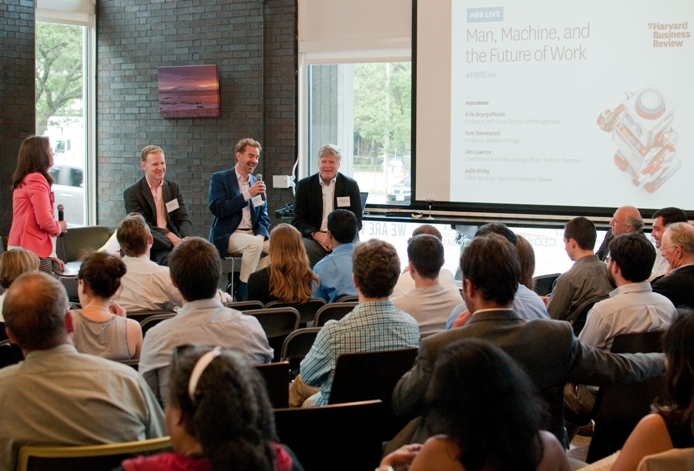 “Man, Machine, and the Future of Work,” an HBR Live event last month, featured Julia Kirby, editor at large at the Harvard Business Review, moderating a panel discussion with Erik Brynjolfsson (MIT Sloan School of Management and co-author of The Second Machine Age), Tom Davenport (Babson College, and author, most recently, of Big Data at Work), and Jim Lawton, chief product and marketing officer at Rethink Robotics. Both Brynjolfsson and Davenport have written extensively about the impact of information technology on society, enterprises, and individuals. For his part, Lawton added to the discussion the voice-from-the-trenches as Rethink Robotics is one of a handful of companies at the forefront of introducing “collaborative robotics” to manufacturing. Unlike earlier industrial robots (typically ensconced in a cage), collaborative robots are designed to work safely in close proximity with humans. Sixty-five percent of traditional robots are installed in the automobile industry, said Lawton, and it takes 200 hours to program (and re-program) them. The good news, from his perspective, is that ninety percent of manufacturing tasks can be automated and he expects 150,000 collaborative robots to be installed worldwide in 3 years. On the day of the event, ABI Research published a new forecast putting the market for collaborative robots at over $1 billion in 2020, with an estimated 40,000 units shipped that year. No estimate was provided as to how many manufacturing workers will be shipped out of a job, but Lawton reminded us that most people in manufacturing are men in their fifties that don’t have other work experience. He also mentioned the urgency by which his Chinese customers regard the adoption of Rethink Robotics’ collaborative robots as opposed to American manufacturers. For Brynjolfsson and Davenport (and many other commentators recently), however, the focus is not on manufacturing workers but on the new threat robots (and software algorithms) pose to knowledge workers. As Davenport told the audience at HBR Live, typical past reactions to automation have been “don’t worry, there will always be knowledge work for you.” Not anymore. The Second Machine Age, according to Brynjolfsson and his co-author Andrew McAfee, is about automating cognitive tasks. While in the First Machine Age people controlled and worked with machines, in the Second Machine Age, algorithms and software-driven robots will increasingly substitute for the work of knowledge workers. So what should knowledge workers to do in the Second Machine Age? In “Beyond automation: Strategies for remaining gainfully employed in an era of very smart machines” (Harvard Business Review, June 2015), Davenport and Kirby “reframe the threat of automation as an opportunity for augmentation.” They propose five ways by which people may renegotiate their relationship to machines: Step up or finding a job a computer cannot do (just like the traditional response to automation); step aside or choosing a career where specific human characteristics (e.g., empathy) are needed; step in or monitoring and modifying the work of computers; step narrowly or finding a specialty that wouldn’t be economical to automate; step forward or developing the next generation of computing and AI tools. In this framework, collaborative robots are stepping in to augment the work of humans. With their impending proliferation, we might even find ourselves insisting on bringing to work our favorite robot, just like we insisted on bringing to work our preferred mobile device (known in corporate circles as the Bring Your Own Device movement). At the HBR Live event, Davenport renamed the Second Machine Age as the age of Bring Your Own Robot. He also observed that automation only leads to commoditization of industries and recommended augmentation as the preferable strategy for all enterprises today. But what is the right strategy for society? How do we get everybody to step in the right direction? What’s to be done about the new threat to knowledge workers? Brynjolfsson would like all of us to spend more time thinking about the challenges brought about by the rise of smart machines. He wants to have a national discussion. To this end, he and a number of other academics, venture capitalists, and business executives have released earlier last week an “open letter on the digital economy.” They call for public policy changes, new business models aimed at “inclusive prosperity,” and better research on the economic and social implications of the digital revolution. Two years after publishing the book that popularized the term “automation,” Diebold “stepped forward” in 1954 (when he was twenty-eight), not by developing the next generation of computers, but by establishing one of the first consulting companies advising businesses on how to adopt this new technology. An entire new industry and entire new breed of knowledge workers followed in his path. “Automation” has created a lot of new jobs and there is no reason why robots will not create even more knowledge worker jobs—in consulting, servicing, help-desking, observing, counting, talking, analyzing, researching, marketing, selling, etc. How about that quintessential knowledge work, that of a lawyer? Sure, we now have E-discovery leading to Armies of Expensive Lawyers, Replaced by Cheaper Software. But how many expensive lawyers were “replaced” by the advent of LexisNexis in the 1970s? Diebold predicted that the “day-to-day work” would not be automated and what he probably had in mind was that secretaries will keep their jobs. The fact that they didn’t show how difficult it is to predict what impact computers will have (or not have) on knowledge work. They were not replaced by computers, but by managers who accepted the new social norm that it was not beneath them to “answer correspondence and the like,” as long as they did it with the new status symbol—the personal computer (see here for more on the social life of computers and why it complicates our predictions). The more things change, the more they stay the same—in talking about technology and its impact on society. What changes is technology itself, in ways that we consistently fail to anticipate. This entry was posted in AI, Robotics, robots. Bookmark the permalink.